St Mary’s Handbridge Centre has received a £20,000 funding boost from Postcode Community Trust, a grant giving charity funded entirely by players of People’s Postcode Lottery. 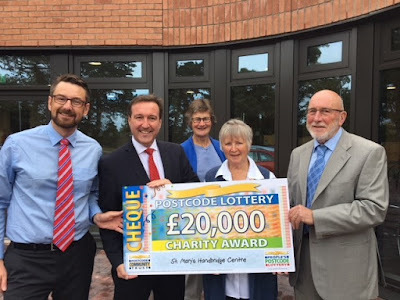 Ted Graham was joined by local MP for the City of Chester, Chris Matheson, as he received the cheque from People’s Postcode Lottery’s head of public affairs, Malcolm Fleming on Tuesday 18 September, 2018. Alison McLellan and Helen Brophy were also present, with both being extremely instrumental in the supporting and planning of the new centre.